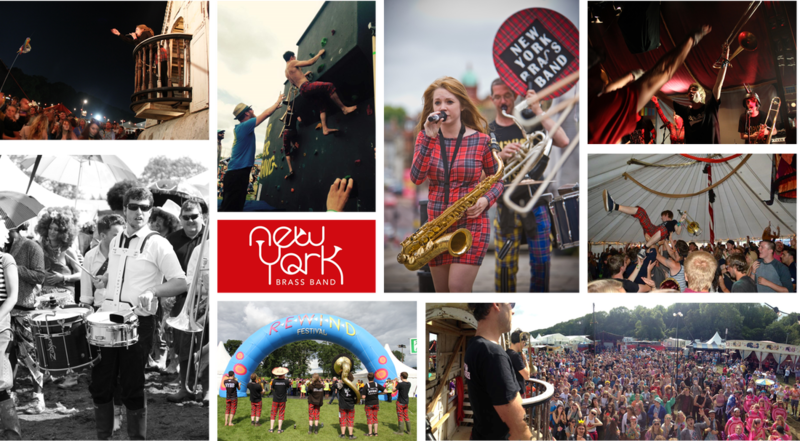 New York Brass Band love a good festival and good festivals love NYBB! In an era where many bands play along to a track, NYBB are guaranteed 100% live, brash brass. Our festival highlights are the crowd surfing trombone solo at Y Not festival, jamming with Rick Astley at Rewind 80s festival, playing at Batumi Heat festival in Georgia and Soundwave festival in Croatia, and most definitely the 5am Hell Stage set at Glastonbury 2015! In addition to large mainstream music festivals, NYBB have played at many jazz festivals, proving the versatile crossover style of music can work for many audiences. Our jazz festival highlights are appearances at Scarborough Jazz Festival, Wigan Jazz Festival, Cork Jazz festival, Manchester Jazz Festival, Burton Agnes Jazz and Blues festival, London Jazz Festival and a sellout concert at Hull Jazz Festival. If you are looking to book NYBB for a festival, email us at lancasterjazz5@aol.com. A wedding proposal at Glastonbury 2015 from New York Brass Band on Vimeo.